Last Wednesday, the National Statistics Coordination Board (NSCB) released the official poverty statistics. One of the highlights is the increase of poverty incidence in the country to 26.9% for families in 2006 compared to 24.4% in 2003. Gustong sabihon, maski gurano kagayon kan mga uru-istorya ni Presidente Gloria Arroyo manungod sa ekonomiya, dai pa man giraray ini nagtagos sa baba lalo na sa mga puru-pamilya. Another highlight is the slight improvement of the ranking of the Bicol Region from being the second poorest in the year 2000 to the fourth poorest region. And poverty incidence also decreased by about 5%. The problem, the figures are still almost twice the figures in the national level. Bicol’s poverty incidence in the year 2000 is 45.3% as opposed to the country’s 27.5%; and 40.7% to 26.9% for the regional and countrywide figures, respectively, for the year 2006. The latest figures also show the province of Masbate sliding in the list from being the poorest province in the country in the year 2000 with 70.2% poverty incidence to the 8th most poor in 2006 with 59.5%. Maogmang mamundo na istorya. Maogma dahil nag-slide pababa pero mamundo dahil nasa top-ten most poor province pa man giraray an Masbate. Kun sabagay, progress is not attained overnight. 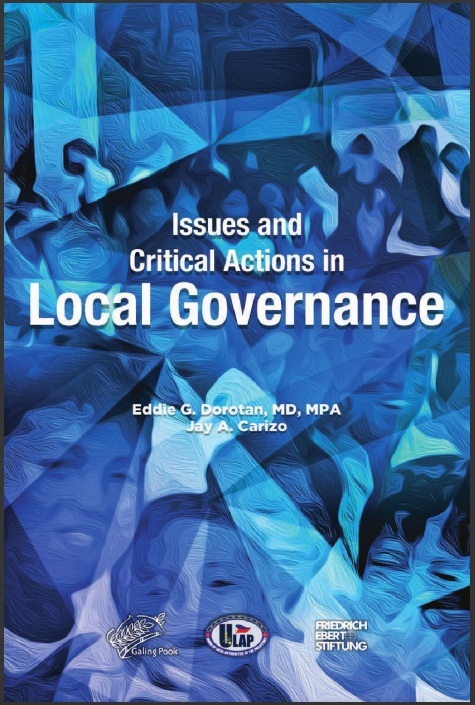 Sarong eksplinasyon kun nata nagbawas an poverty incidence sa Masbate iyo an conversion kan Municipality of Masbate to a city. Dahil digdi, nadagdagan an inaapod na internal revenue allotment o ang parte kan local na gobyerno sa income kan nasyon. Commerce in the area also became active in one way or another. But it only influenced the nearby municipalities. Cawayan, Placer and San Pascual, ang mga munisipyo sa mag-ibong na puro kan probinsiya, dai man naapektuhan. Ini an mga lugar na lalong nagpapataas kan insidente ki kapobrehan sa bilog na probinsya. Mala ta base sa estimate, maabot sa kabangang milyon (487,672) an tutal na pobre sa lugar. 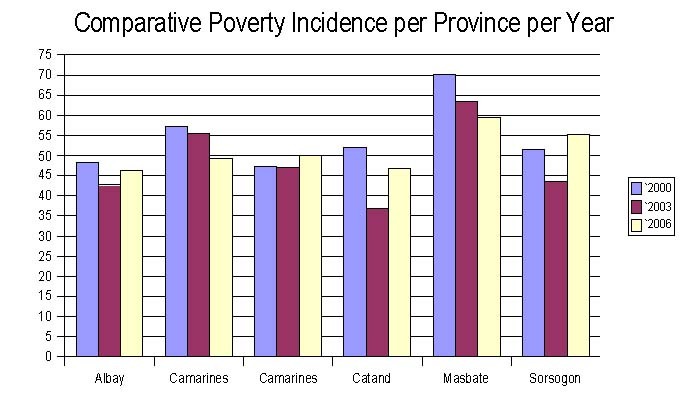 But while Masbate’s poverty incidence decreased, the case is otherwise for Camarines Sur, Sorsogon and Albay. Poverty incidence in the Villafuerte’s “Premier Province of Bicolandia” increased from 47.2% in 2000 to 49.9% in 2006 while in the province at the tip of the Bicol Peninsula, the figure hike to 55.3% from 43.5% in 2003. The land of Sarong Banggi also recorded an increase from 42.7% in 2003 to 46.2% in 2006. The increase of poverty figures can be explained by the typhoons that hit the country particularly Albay, Sorsogon and Camarines Sur. Being largely dependent on agriculture, the typhoons messed up the local economy. 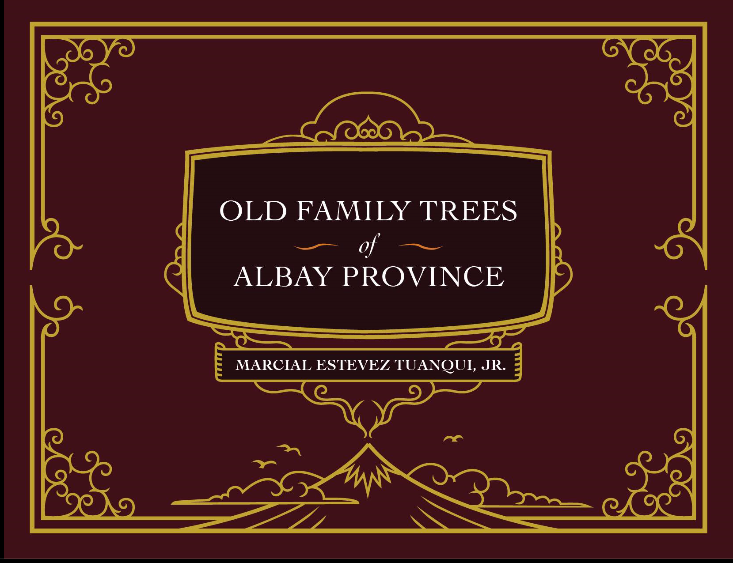 To note, it was also in 2006 when one of the greatest tragedy happened in Albay — the landslide that buried almost all areas in the southern quadrant of Mayon Volcano leaving thousands of bodies either dead or missing. 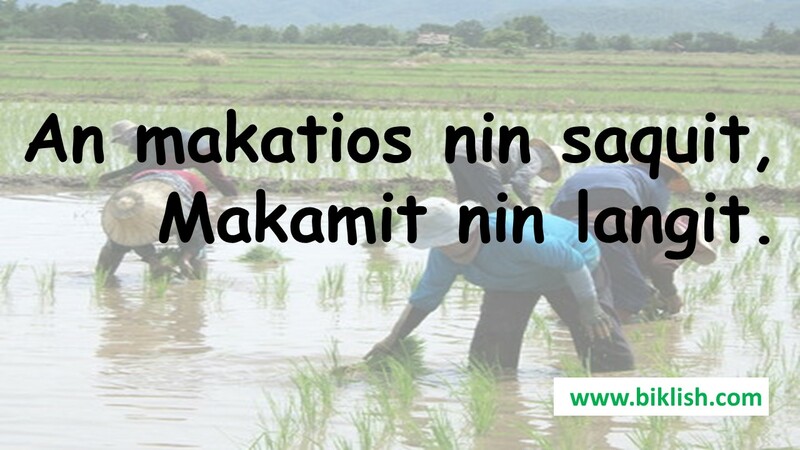 Similarly, the typhoons also flooded the ricefields of Camarines Sur known for being the breadbasket of the Bicol Region. aw inda ta nabawasan pa ngani an sueldo ko ta ababaon dolyar. dati an $1 ko Php54. na, o ngunian pira na sana ? beken lalo na akong madifisilan ? tuwad tuwad na ako ka trabaho, kapaalila sa mga puti. maray kon nag ababa dolyar nag ababa man barakalon ! agree ako sa obserbasyon mo. an apod kaan, pocketbook economics. an tinataong istatistika kan gobyerno base sa aggregate figures o national/macro economy na inaapod. iyan kino-compute base sa total na income kan gabos na mga Pilipino. an problema, bako gabos na figures na an nagre-reflect kan tunay na sitwasyon kan mga simpleng namamanwaan. lalo na satuya na dakulaon an inaapod na income gap kun saen an mga mayayaman dakula an income asin an mga kasaradayan wara o kun igwa man, sabi sa rinconada, “kagagatikot”. dahil mas dakula an income kan mga mayayaman, matatabunan an income kan mga kasaradayan kaya kun i-compute mo, mahihiling na may pag-asenso pero sa totoo lang dai man nagre-reflect an tunay na sitwasyon kan nasyon. arog ngonyan, 7.3% an income na pinagmamamalaki kan presidente pero haen an? nata ta halaba pa giraray an pila sa mga tindahan para sa baratong bagas? nata ta may mga nagugutom pa giraray? dakul pa giraray an arog saimo na nagluluwas sa nasyon para maghanap ki trabaho?